So, you’ve recently been asked to co-sign on a bail bond. While you have nothing but the interest of your loved one at hand, this is a significant move on your part. Whether you’re on the fence about signing or you’ve recently co-signed, it’s always good to know what your role is and what to expect once the bail has been posted. In today’s blog, we will provide you with the information that you should have handy and walk you through some of the most frequently asked questions that we receive. Let’s start with some basic understanding of what it means to co-sign a bail bond. Being the co-signer of a bail bond means that you are signing an agreement that states you will financially pay the entire bail amount if the defendant does not appear in court. As you may know, the bail amount is given back once court has been attended. In the case that it is not, the full amount is due. When you are a co-signer, you become the individual that is responsible for that amount being paid. While that is a big responsibility to take on, there are times where this is the only option for a defendant to receive the financial assistance they need to post bail. That being said, once you have co-signed the bail bond, the defendant will be released from jail. If you’re considering being a co-signer for your loved one, there are two important things that you should be aware of. For starters, by co-signing the agreement, you are ensuring that your loved one is released from jail. Secondly, as the co-signer, you can take on the responsibility of making sure that the defendant appears in court and adheres to any other legal requirements to ensure you aren’t responsible for the full bail bond amount. While the intentions behind co-signing are good, not everybody is able to be a co-signer. There are some requirements that need to be met. The first requirement is that the co-signer must be a legal citizen of the United States. Aside from that, they need to live in the same area for a certain amount of time, have proof of a stable income, and pass a credit check. After all of these bases have been covered and approved, you can then proceed with co-signing the bail bond. If you are eligible to co-sign for a bail bond, congratulations! 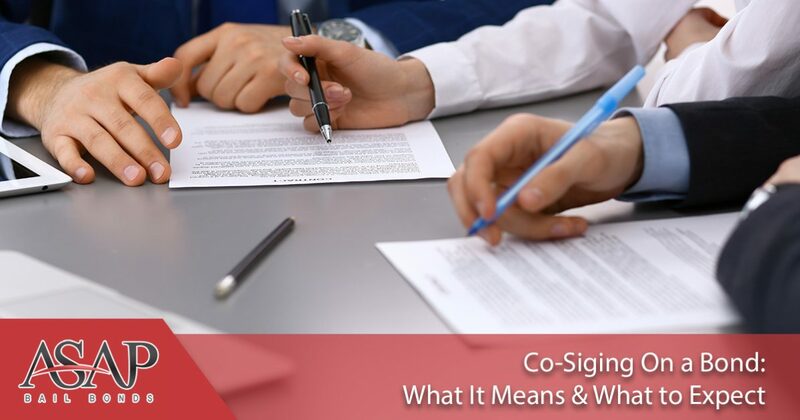 Now it’s time to learn what it means to be a co-signer and what you can expect. Keep reading to learn about this role and what all it entails. The actual process of co-signing isn’t something that you should be overwhelmed by. In reality, it’s a pretty straightforward process. In order to co-sign for a bail bond, you will need to provide some sort of physical property to use as collateral. Most often, this is in the form of cash. Your local bail bondsman will require anywhere from 10 to 15 percent of the full bail amount at the time of the signing. This collateral is used in the case that the defendant does not attend court and they wind up needing to recover the money that they have pledged. In the instance that they do not attend, you will be the one responsible for paying the bond amount to the bail bond company. As the co-signer, you have the right to require stipulations prior to the signing. The stipulations that you make are entirely up to you but should ultimately help ensure that the arrestee attends court. Depending on the charges that were made against the defendant, you could set stipulations that include attending treatment, getting drug tests, visiting a medical professional, or the like. Aside from that, the co-signer is also able to ask for the bail bond company to cancel said bond at any point if these stipulations are not met. The bond can also be revoked if the defendant is acting in such a way that creates discomfort, fear, or seems to be dangerous. In these incidents, the defendant will be returned to jail, and their bail will be revised. Without a doubt, one of the most significant risks of being a co-signer is the chance that the defendant that you’re getting bail for does not attend court. The primary reason that this should be a concern is that you then become the individual responsible for paying the full bail amount. In the case that the bail bond company has to hire a professional bounty hunter to retrieve the defendant, the co-signer could be charged for the additional services. While we hope that this is never the case for a co-signer that we work with, we do want to make sure that we are not out the money that we’ve fronted. As a co-signer of a bail bond, you are agreeing that you will take full responsibility for the full-amount granted in the case that they do not appear. If this is something that you’re not comfortable with, it might be better to look into additional options of posting bail that your loved one could take advantage of. By no means is being a co-signer an easy decision to make, but it is one of the most efficient ways to get your loved one out of jail. Aside from that, it’s an incredibly kind thing for you to do when the defendant is out of options for posting bail. Whether you’re ready to co-sign a bail bond for your loved one or you’re interested in learning more about the process, contact ASAP Bonding. We would be more than happy to get the process of co-signing started or answer any questions that you may have. ASAP Bonding provides the Duluth area with the professional bail bondsman that they need when things get tough. Reach out to us today if you have any inquiries or questions that we can help with.